The leader of the Vermont National Guard has a message for Burlington voters. It’s about a ballot question on the new F-35 fighter jets heading for the Green Mountain Boys next year. 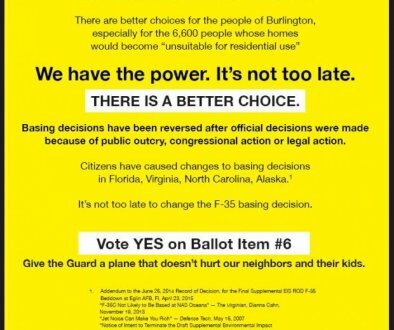 Opponents of the jets pushed for the nonbinding question on the March ballot requesting cancellation of F-35 basing at Burlington airport. Maj. Gen. Steven Cray says even though the measure won’t change the Air Force’s decision on the F-35, he’s speaking out because it could trick voters.